It’s said that you never have a second chance at a first impression. In the cold-calling world of an outbound sales representative, this is typically the case. A first impression with a decision maker, however, doesn’t happen unless you actually reach that decision maker. The Sandler Sales Training methodology instills a protocol in sales representatives providing a framework to follow to bypass gatekeepers, reach decision makers, and convert suspects into paying customers. The Sandler Sales Training methodology dates back over thirty years and has brought international acclaim to the company. Using basic techniques of tonality and voice inflection are critical components of reaching and appealing to a decision maker. Instinctively, people like to help someone struggling or in need. 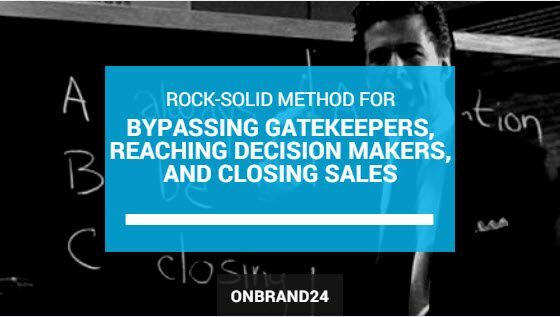 The Sandler methodology teaches sales people to inflect their voice in such a way that the gatekeeper feels compelled to help them. For example, asking the gatekeeper or receptionist, “I’m not sure if I have the right person, but I thought maybe you could help point me in the right direction?” By doing so, you help lower their guard and encourage them to propel you in the right direction. Once you’ve reached the appropriate decision maker, help once again is sought. For instance, “Hi, this is Tom from XYZ Company, did I reach you at a bad time?” Many times, prospects don’t know how to respond and often times say “no” or “not really Tom, what can I help you with”. Now you can focus on uncovering pain points. Now that the decision maker is on the phone and has granted you permission to continue, they’ve opened the door for you to explain your value proposition. In doing so, you must be concise and frame it in such a way that you remove traditional objections to your company’s value proposition while seeking common pain points among the industry prospects. Sandler Sales Training calls this the “Thirty Second Commercial”. Asking a prospect for thirty seconds often disarms them and places a finite limit on the length of the call and an end in sight for a reluctant prospect. In the thirty-second commercial, the salesperson will once again introduce his or herself and identify their company and one strong point of credibility. Such as, “Like I said before Mr. Prospect, this is Tom from XYZ Company, a widget producing company that has been in business for over 30 years.” This gains credibility for your company and reinforces to the prospect that they’re talking to someone from a legitimate, reputable company. Next, the representative is taught to introduce the “Objection Remover”. In every sales industry, there are common “go-to’s” for decision makers, such as “I already have a product that does that” or “My team already has the sales channel covered”. The Sandler Sales Methodology teaches us to address this objection before the prospect has the opportunity to use it as a weapon of deflection. Immediately following the representative’s company credibility statement, they will address the typical objection by framing it around potential pain points in the industry targeted. For the sake of a colorful and meaningful example, let’s hypothetically look at adding outbound telesales and marketing as part of a traditional sales team. The representative is trained to start with the Objection Remover, followed by stating three points of traditional pain, “ So Mr. Prospect, I’m sure your sales team is industry leading and have your pipeline of opportunities filled with leads, but if you’re like many of the companies that partner with us, you may still find that 1. Many of your pipeline leads aren’t fully qualified, or 2. Your sales people don’t like making cold calls and aren’t fully tapping that sales channel, or maybe even 3. You wish your sales pipeline had more qualified leads from different verticals or geo-locations. By removing the objections first, (Sales team is fine, industry leading, filled pipeline) the Sandler methodology removes the common push back. Next we can start the “drilling for pain” portion of the thirty-second commercial. Points 1, 2, and 3 are all common pain points for Sales Managers/Directors/VPs. Integrated in each one of the pain points presented was a solution that the sales reps’ value proposition addresses. Following the presentation of the thirty –second commercial, the salesperson addresses the time is up and asks the prospect if any of those points apply to him/her and asks if it’s worth discussing any further. At this point a prospect may open the door for a more in depth conversation on the spot, in which case the salesperson will go back to the pain points presented and ask the prospect to explain in detail, such as: “could you tell me a little more about why your sales people don’t like to cold call?” or “why aren’t your leads fully qualified?”. This allows us to understand what pain really exists so that we can present value in the most effective manner. The Sandler Sales Training methodology is something that sales people and outbound cold callers alike can and will find success applying to their efforts. Using the basic framework of the thirty-second commercial of an opening, an up-front contract of taking thirty seconds to share the value proposition, and seeking pain points in the form of addressing them via your company’s solutions are sure-fire ways to get a conversation started, or getting an answer nearly as positive as a yes, a NO. The thirty-second commercial also gives the prospect an easy “out”, a pain-free “No” by simply telling the caller that they aren’t interested or facing these pain points. A no is almost as good as a yes; in that you no longer spend time focusing on that prospect, you move on to the next potential yes!